When: July 8, 2010 • Where: Minnesota Zoo (“Music in the Zoo” Concert Series) • Who: Trombone Shorty, trombone and trumpet; Michael Ballard, bass; Pete Murano, guitar; Dan Oestreicher, baritone sax; Joey Peebles, drums; Dwayne Williams, percussion; Tim McFatter, tenor sax. 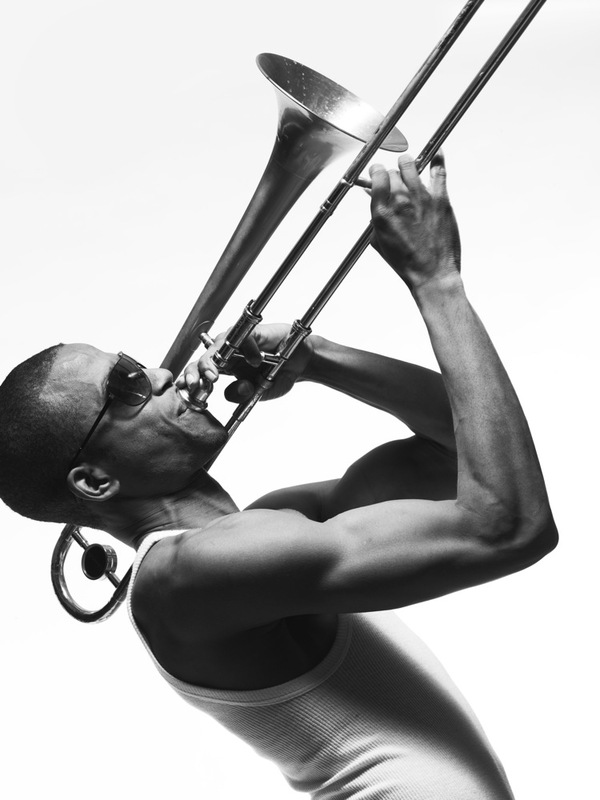 Trombone Shorty can play the trombone and the trumpet. He can sing, from low notes to a sweet falsetto, Marvin Gaye to Louis Armstrong. He can write songs and dance, channeling James Brown and Prince and Michael Jackson. He can hold a crowd in the palm of his hand and bring it to its feet. Is there anything he can’t do? Stand still, phone it in, and be boring. 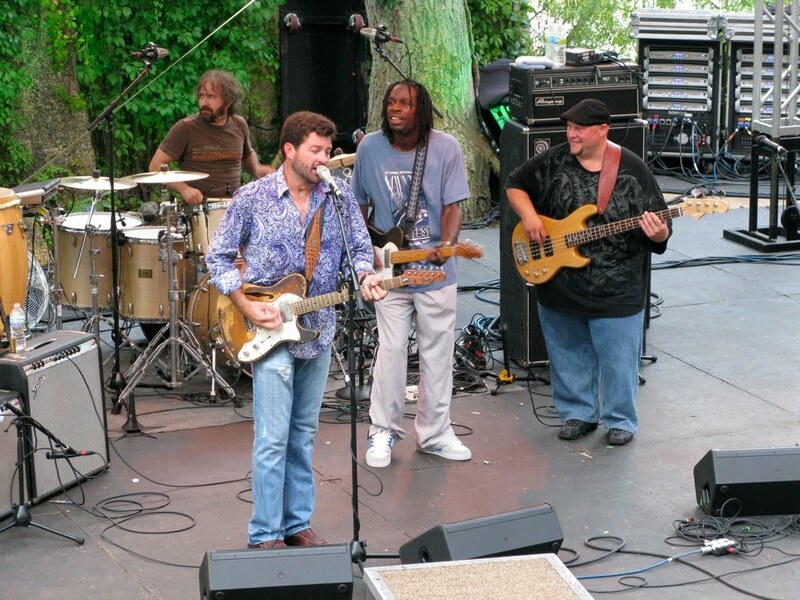 The set would have been longer had bayou bluesman Tab Benoit, the opening act, gotten off the stage sooner. Benoit delivered some blistering tunes (like Albert Collins’ “Too Many Dirty Dishes”), but he overstayed. Not only did he play beyond 8:30 (shows at the Weesner start at 7:30 and end at the zoo’s 10:30 curfew), but he spent several minutes exhorting us to do something about what’s happening to New Orleans, our rights as citizens, the government, the National Guard, and more. Benoit is known as an environmental activist, but if he wanted to give a speech, he should have done it earlier and in fewer words. Long, tall Shorty (who earned his nickname at age 4, when his trombone had several inches on him) came out in a black T-shirt with a sparkly fleur-de-lis on the back. His band formed a half-circle around him, and over the course of the set he went from one band member to another, urging them on (“Put a little chicken grease on that guitar!”). It’s a good-sized band, seven players, with big brass, big rhythms, and big energy. Along with Shorty’s trombone and trumpet, it includes tenor and baritone saxes, electric guitar, electric bass, drums, and congas. Shorty is just 24, and everyone else is around the same age; the old man of the band (bari sax player Oestreicher) is 27. We hear “American Woman” (Shorty spent time in Lenny Kravitz's band), something called “Rats and Roaches Around My Home” (I think that’s the title; when I Google the lyrics, most hits lead to Orkin), and a long and playful trombone solo. Shorty sings “Shake your thing/Watch yourself/Show me what you’re working with” and by now many people are down in front doing just that. He’s riveting, charismatic, working the whole stage, and you can’t take your eyes off him. For “Hurricane Season” from his new CD Backatown (Verve, 2010), his first major-label recording and the reason he’s on tour, Shorty switches to trumpet and gets the crowd to shout “Hey!” Between and during songs, he twirls and poses, making beautiful arcs and curves with his lanky body. He hikes up his pants. Two more songs from the CD—“One Night Only,” “Something Beautiful”—and time runs out. They close with a rousing “When the Saints Go Marching In” (during which Shorty sings like Louis Armstrong) and it’s all over. We catch him briefly on his way toward the CD sales/autographing table and mention that we’ll see him in Monterey. He says, “When’s that? Two weeks?” More like two months. When you're a fast-rising star, keeping schedules straight is what managers are for. Point-and-shoot shots from last night's concert (SLRs aren't allowed at Music in the Zoo shows). 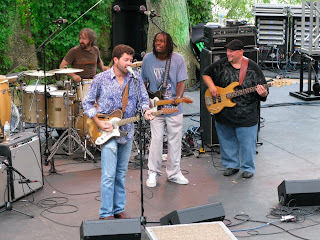 Benoit and his band, with guest Bernard Allison (son of Luther). Trombone Shorty's band, and the setting. Michael "Bass" Ballard throws himself on the ground and keeps playing as the band gathers around. P.S. The Weesner must be the only music venue in the world where, as you’re walking the curving paths leading toward it, you might hear a low, rumbling growl off to your left that makes you want to run for your life. I checked a zoo map later. Tiger. Top photo of Trombone Shorty by Kirk Edwards.